shows us how things really get discovered and done." 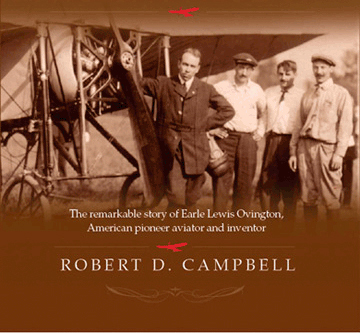 Robert D. Campbell is a first time author who has followed his passion to tell the story of a long-forgotten inventor, American hero and early aviator, Earle Lewis Ovington, who was sworn in as this nation’s first Aeroplane Mail Carrier. Anchored in the optimism of the late nineteenth century, Earle Ovington was a visionary who continually looked to the future. Virtually forgotten today, he lived a life of which most people can only dream. Reminiscences of a Birdman tells for the first time to a new generation, the complete story of this uniquely American hero. An amateur photographer and lifelong collector of nineteenth and early twentieth century photographs, glass plate negatives, and related photographica, Robert turned his interest in history and love for photography into a draft for a book on nineteenth century amateur photography. In his pursuit of collecting photographs and negatives by amateur photographers of past centuries he discovered glass plate negatives taken by a young Massachusetts Institute of Technology student named Earle Lewis Ovington. Although initial research showed that Earle was known primarily as America’s first Air Mail Pilot, Robert sensed there was much more to the story of Earle Ovington. Further investigation at the MIT Museum in Cambridge, Massachusetts, uncovered correspondence with Ovington’s descendents. A letter to Earle’s granddaughter on July 4, 2000, initiated a nine-year correspondence via e-mail and letters, resulting in interviews with the aviator’s aging son and culminating in a trip to Ohio to meet Earle’s granddaughter and access her historic family records as a background to his own research. By painstakingly acquiring original source materials, articles, photographs and numerous contacts over a period of nine years, Robert was slowly able to locate and assemble the missing pieces to complete the picture puzzle that was Earle’s life. Robert retired in April of 2008 to focus all of his attention to completing his passion, publishing the story of the life of Earle Lewis Ovington. Married almost forty years to his high school sweetheart, Robert is the father of one daughter and grandfather to three grandsons. Robert Campbell resides with his wife Rosemary in the historic Blackstone Valley in Massachusetts. The author is available for book signings through the publisher.